Robert Tucker’s first wife was Mary Ada Bradford, born 10 September 1846 in Montgomery County Alabama as the oldest of four children to parents William Patrick Bradford and Minerva Catherine Blair. Mary’s father was a road overseer in Lawrence County, Alabama, which meant that he was paid by the county to maintain local roads. County records tell us he was in charge of “Florence Road” between Moulton, Alabama and the Franklin County line to the west in 1850, and of the road between “Travis Barbee and Melton’s Bluff” in 1856. Melton’s Bluff is located north of Courtland, Alabama on the southern bank of the Tennessee River, and Travis Barbee may have been the old location of a manor house. This work, and the presence of a father in the home, appears to have made Mary’s family more prosperous than Robert’s prior to the Civil War. In both the 1860 Federal Census, William P. Bradford is listed as having $1000 in real estate, and $1000 in real estate, or a total estate value of about $54,000 in contemporary terms (compared to the Tucker’s family net worth of about $4000). ​Mary’s father, William P. Bradford, was also known as “Wild Bill” and had a reputation for being litigious and getting into trouble with the law. In 1849, he and his brother Thomas were arrested for “gaming” or “gambling”. In 1850, he was indicted for failing to keep a road in good repair as overseer, and in 1853, for reasons unknown, he was fined $5 plus $36.21 in court fees alongside two other men; Stephen Little and William C. Guthrie. Between 1853 and 1869, he was involved as either a plaintiff or a defendant in six different lawsuits. IN 1853, he and his brother Richard sued Mansell Brown and initially lost $6 plus $6 more in court fees. They appealed and later won $14. The next year, he was sued by Pallas Neely for $40 in a land dispute. In 1855, he sued Aaron Masterson, the Justice of the Peace, for taking a “dark bay colt” to pay off Bradford’s debts. Bradford said the animal should have been exempt from seizure because it was his only horse. He lost the case, and was charged $83.90 in court fees. Three years later, he was sued by D. T. Whitney in a land dispute, and in 1861 by French D. Haggard for the return of a seven-year-old grey horse. By this time, of course, the Civil War had started. Though Mary’s brothers did not serve in the war (the oldest was only 11 when it broke out), it surely had an effect on the family, as Union troops occupied the area and were driven out again and again. Perhaps the most important event for Mary during this time, however, was the death of her mother on 23 May 1865, just 44 days after the war ended. Robert Humphries Tucker was a Civil War Veteran born in South Carolina in about 1843. The second from the youngest, his family moved to Lawrence, Alabama in about 1846. He joined B Company of the 16th Alabama Infantry when he was about 18 and fought in several battles including the Battle of Shiloh and the Battle of Stones River (Murfreesboro), in which he was wounded. On his return home, he married Mary Ada Bradford and the two had six children. The couple moved to Parker County, Texas sometime around 1878-9, where Mary died of the measles. Robert married once more to Emma Redmon and moved to Southwest Oklahoma (then known as Indian Territory) around 1890. He had nine more children before his death in Clay County, Texas in 1919. ​Two weeks after her mother’s death, Mary’s future husband, Robert H. Tucker, was released from military prison at Point Lookout, Maryland. The war had changed many things in the South. Whereas before the war, Robert’s poverty may have prevented him access to Mary’s hand in marriage, after the war, the two were on much more equal footing. Much of the Bradford family fortune appears to have been lost over the course of the war. Whereas in 1860, Mary’s father had a net worth of $2000, in the 1870 Federal Census, he claims only $435 (about $7600 in modern terms). This, combined with the fact that many eligible men in the area had died in the war, gave the relatively impoverished Robert more than a fighting chance in courting this formerly relatively wealthy southern belle. Only about eight months after the release of his status as a prisoner of war, Robert and Mary were wed on 1 February 1866. The war had taken much, but it had also given these young people new opportunities. We know little about Mary’s life between her marriage in 1866 and her departure with Robert and her family for Texas in 1876. She and Robert had their first child, James W. Braxton Tucker, on Christmas Day in 1866. Their second, Richard Alford Benford Tucker, was born just three years later. A daughter, Minerva Cynthia Anna Tucker (who received her name from Mary’s mother), arrived in 1871, and Adelaide Tucker in 1874. Court records suggest that during this time Mary and Robert remained in the Lawrence County, Alabama area. Mary’s father continued his relationship with the courts. In 1869, Mary’s father won a lawsuit against Stephen Little (the same man who was arrested alongside him for gambling 20 years earlier). In 1872, matters with Mary’s father took a significant turn for the worst when he was fined $30 alongside his brother Thomas W. Bradford (who was arrested for selling liquor without a license) and Hugh Sutton. The next year, he was charged with adultery along with a woman named Hester Ann Wade. Hester was a married woman with four children who was 20 years younger than Bradford. Both Bradford and Hester Wade were indicted before a grand jury for “living together in a state of adultery and fornication”. Mary’s husband, Robert Tucker, as well as her brother, Richard Bradford, are listed as witnesses in the case. Whether or not Mary’s father was found guilty remains unknown, but it is very likely that he had a relationship with Hester Wade, given evidence that will be discussed later. Mary’s father’s legal troubles continued, as he was charged on three separate counts of assault and battery in 1874, Again, William P. Bradford was indicted before a grand jury, this time for assaulting and beating Miss Martha F. Bridges, Mrs. Matilda Bridges, and George W. Minters. This kind of behavior is why Mary’s father was known as “Wild Bill”. On 19 September 1875, Mary’s brother, Richard Hayes Bradford, married Sarah A. Bradford in Lawrence County, Alabama. The following year, Mary, Robert Tucker, and their children, moved to Texas, where, in 1878, they eventually settled in Parker County, Texas. Her father and brother Richard remained home in Lawrence County, Alabama. While in Parker County, Mary and Robert prospered and had three more children. Myrtle V. Clara Tucker was born to them in 1879, Rushing D. Tucker in 1882, and Henry Warren Tucker in 1884. Rushing received his unusual name from Robert’s neighbor and pastor, George Whitfield Rushing (1848-1925). G. W. Rushing was the pastor of the local Cumberland Presbyterian Church, which Robert Tucker likely attended. Robert owned increasingly large tracts of land in Parker County and dealt in livestock, including both hogs and cattle. Back home in Alabama, Mary’s father died on 28 September 1881. He is buried in Old Bethel Cemetery, Leighton, Colbert County, Alabama. After his death, a legal battle broke out over his estate, when Hester Ann Wade (married name Parker) sued for recovery of $1217.74 (about $27,000 in 2016 dollars) in debt Bradford owed to her. Bradford’s two sons, Richard Hayes and William McDaniel Bradford, testified that her accounting was “not just”. We don’t know the decision of the court. Mary, however, is not mentioned in the proceedings. Two years after the death of her father, Mary Ada Bradford Tucker died of Measles in Parker County, Texas on 15 March 1884. She is buried in Clark Cemetery in Parker County. 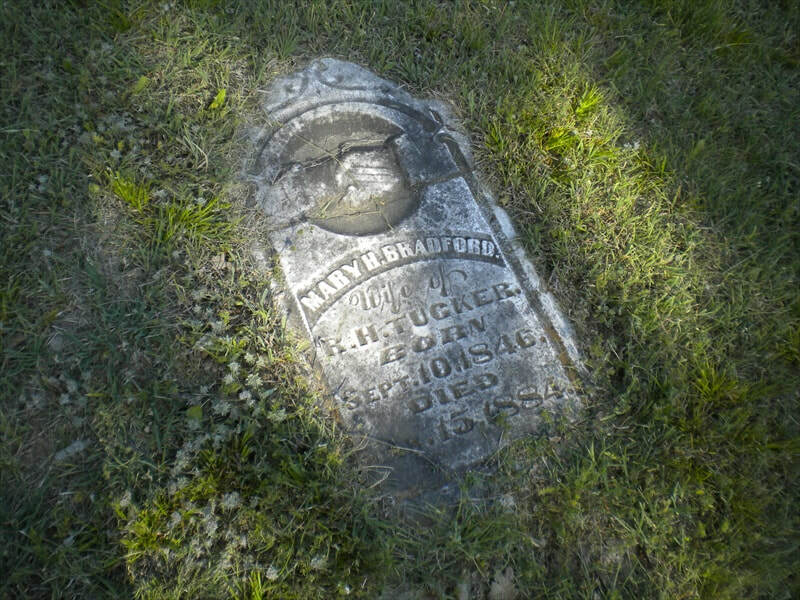 Her headstone reads “Mary H Bradford, wife of R H Tucker”. Though we don’t know for sure, it is possible that Robert’s pastor and neighbor G. W. Rushing conducted the funeral proceedings. Mary had been Robert’s partner for 18 years, and had borne him seven children, the oldest of whom (James W. Braxton) was about 18, and the youngest (Henry Warren) not even a year old. Robert did not remarry until a little over two years later, on 13 May 1886, to Emma Elizabeth Redmon. G. W. Rushing officiated in the ceremony. Robert at this time was about 43. His new bride was a young 22 years old. While this may seem unusual today, it was more common in the south after the Civil War. So many young men had died during the war that it created a huge difference in the number of men versus the number of women living in the south. Many younger women in the south married older men in these circumstances. Robert Tucker’s second wife, Emma Redmon, was the daughter of Sanford Redmon and Elizabeth Brookshire. Her father died during the Civil War, just two months after her birth. She had one sister, Florence Ola Redman. How exactly Emma and Robert met is unclear, but it is possible that she was visiting or staying with her uncle, George M. Dallas Brookshire, who lived in Parker County. Her sister’s family lived not too far away in Dallas, Texas at about the time of her sister’s marriage and may have attended the wedding. After 1886, the family began to spread out. Robert stops showing up in Parker County, Texas tax records. This could mean he simply sold all of his land and had no significant property in the county, but still lived there. It could also mean that he left the county, or at least became more transient, only living in the county part of the time. The latter seems to be the strongest possibility thus far. Although he does not show up in Parker County tax records, important life events for Robert continued to occur in Parker County and the surrounding area until about 1889. On 10 February 1887, Robert’s daughter, Minerva, age 15, married William Ellwood Welch, age 36. She was the first of Robert’s children to marry, and her husband was over twelve years older than Robert’s wife at the time. Later that year, Richard Alford Benford Tucker, age 17, married in Springtown, Parker County, Texas on 2 September 1887 to Katie Elizabeth Arnold, age 16. Two months later, on 15 November 1887, Emma and Robert had their first child, Mary Minnie Gracie Tucker, in Wise County, Texas. Wise County bordered Parker County, where many of their older children still lived. Three years later, on 18 October 1890, their second child, Alvy Dallas Greer Tucker, was also born in Texas. Tax records indicate that in 1889 and 1890, Robert lived in Grayson County, Texas, on the border of Indian Territory, and on 31 July 1890, his daughter Ada married Charles Monroe Pennington in said county. We don’t know for certain what kind of work Robert did while he lived along the Red River Valley, but it seems clear that whatever it was took him into Indian Territory often, along with the family. Indian Territory opened up for settlement on April 22, 1889, resulting in an enormous “land rush” that generated a lot of excitement, activity, and business. It is possible that Robert and some of his older children participated in this land rush as “Sooners”, as many important family events occurred in “Indian Territory” or “Oklahoma” at around this time. For example, two of Robert’s children, Charles and Hattie, were both born in Oklahoma in 1892 and 1894, and Warren Isaac Madden Tucker and Oma Gano Tucker, were both born in Indian Territory in 1895 and 1898, respectively. IN the meantime, Robert’s oldest, James W. Braxton Tucker, married Fanny Pennington in about 1894, probably also in Indian Territory. Their first son, Hugh Basil Tucker, was born in Tishomingo, Indian Territory. Tax records indicate that Robert owned property in Cooke County, Texas, which bordered Indian Territory, from 1894-1896. Records for Indian Territory and Oklahoma Territory, however, are sparse and tend to come secondhand. The Tucker family does have one early account of life at this time from Robert’s grandchild, Maggie Tucker, who described moving to what is now Eldorado, Oklahoma in about 1897 and living in a dugout left to her family by her Aunt Ada Tucker and her husband Charley Pennington.